I know I said I wouldn't be reviewing exclusives from that website anymore, but f*$% that! I paid for this figure and it's mine now to do with what I please, so let's take a look at the master of the "Diamond Cutter", Diamond Dallas Page! By now we know that Mattel's not exactly breaking records with their online-only wrestling action figures, an avenue they insist is aimed at adult collectors. So why aren't these figures selling out like many of Mattel's other lines? DDP was the second WWE Legends figure released online, but is the first of the "fan voted" figures to appear. When promotional images surfaced many fans were upset at some of the facial details, stating that the hair style and facial hair color were off. Let's take a closer look at the figure and see if the criticism is justified or just fanboy nagging (well, obviously, it's not). BANG! Although we (the fans) voted on the Superstars to be included this year, it was the designers who ultimately decided what version of those wrestlers would be released. For some figures the choice was simple, like Andre the Giant, but others have a few different looks they're known for making any choice controversial. In the case of DDP, you could pretty much distill him to three looks: the short-haired, vest & baggy pants-sporting veteran we saw towards the end of his career, the curly mullet, t-shirt & jeans version and the version we ended up with. Personally, I would have chosen the jeans & cutoff t-shirt version, but this look isn't bad, either. I don't have a preference between the black tights or the blue one, but with the blue we would have had some more color on the display. I often mention the fact that most WWE Elite figures are done in their black attire (with some Superstars that's their only attire) and they can make the display shelf seem bland. That problem isn't as prevalent in "Legends", but with figures like Stone Cold and the Rock who only wore black ring gear I'm happy when we get a colorful figure. That said, DDP's attire is nicely done. His lower body is molded in black plastic to deliver the tights while his vest (reused from Stone Cold) is molded in the same teal color his waistband is painted in. The vest is later painted black on the outside and has the DDP diamond logo tampographed on the back just like the thighs. The tampos are crisp without any bleeding of the colors. If you're hoping for additional accessories, you're out of luck. That vest is the only thing DDP is packaged with, unless you consider his removable elbow pads as accessories (FYI: I don't). Whether or not you like this attire is a personal matter, but it is well-executed. What is debatable is the final result on DDP's head. Does it look like Dallas Page? Um, yes and no. It's passable as much as some other headsculpts in the line, but the exaggerated grin really throws it off. Perhaps the design team was working off of photos taken during his "Positively Page" gimmick. However, this is supposed to be mid-'90s Page and that leads us to the hair. It's curly, blond and running long towards the back of his head, which is mostly right for DDP, but the way it's styled just doesn't seem right. It's sort of parted to the right. I could be wrong and maybe they used an image where he wore it just like this, but it seems off to me. The other issue is the color of his facial hair. Much like Hollywood Hogan, DDP's blond locks belied the dark whiskers he grew naturally. While I don't think black paint would have been appropriate, I definitely feel the figure needs a much darker shade of brown than the one used. The inaccuracy is highlighted by the portrait of Page on the card art and I'm certain it also contributes to the overall "off" look of the headsculpt. Below the neck DDP is assembled from parts we've already seen in the line multiple times. The torso is the super-buff, but not overly bulky build we first saw on Brian Pillman in series 3 and is used to great effect here. DDP also reuses the same arms as Pillman, but Page has an open right hand and closed left fist instead. I think he also shares Flyin' Brian's lower body or at least most of it, however I'm not a 100% sure. I recently realized that Pillman is a lot taller than he should be. 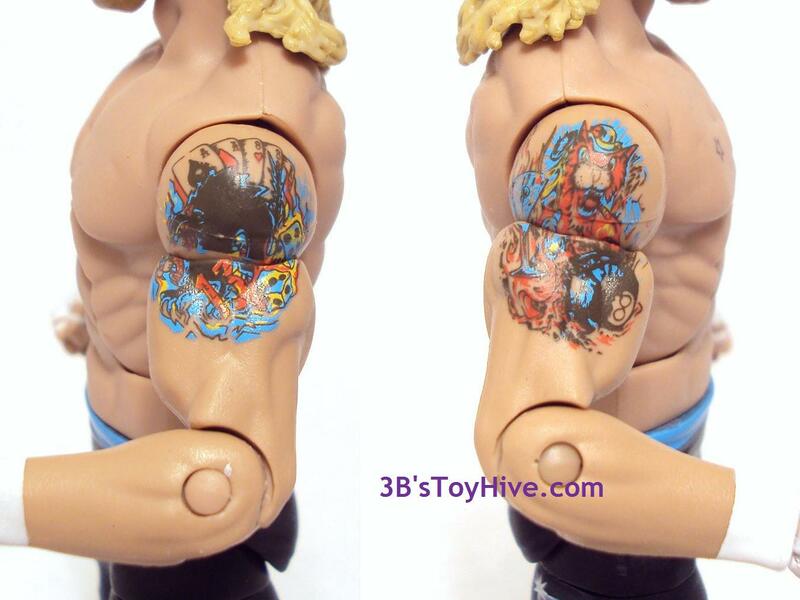 Aside from the logos, vest & waistband, DDP features few paint apps on his body. He has a few multi-colored tattoos on his arms and a very small, I'm-kinda-surprised they added, star outlined over his right breast. The only other paint apps are applied on his hands and wrists to create his wraps. There were no paint application issues on my figure. There's nothing new to write about the "Legends" articulation model. I wish there were, though. DDP would benefit from having some added arm articulation. As is, he's unable to lock both arms around an opponents head for the setup to his Diamond Cutter. Not BANG! So a cursory pass through that website reveals that DDP is still in-stock. So are the more recent releases, (King Kong) Bundy & Arn Anderson. Why are these "fan-demanded" action figures remaining in-stock? Did Mattel overestimate the fanbase? That seems to be a theme for them in 2012. I think the main issue (aside from horrid customer service) is the price point. Toys R Us was selling waves 3-6 of Legends for around $13 per figure. On that website the new Legends are selling for $20 plus over-priced shipping & oddly-calculated taxes, yet the figures are no better than what was at retail. They're not worse, just not better. So why do we want to pay $30 for them? I can just imagine a warehouse stacked with these new Legends figures, collecting dust and waiting for the Fall when Mattel will inevitable discount them (even if it's for just a week or whatever) and that's when I will break my boycott of that website and complete my Legends collection. 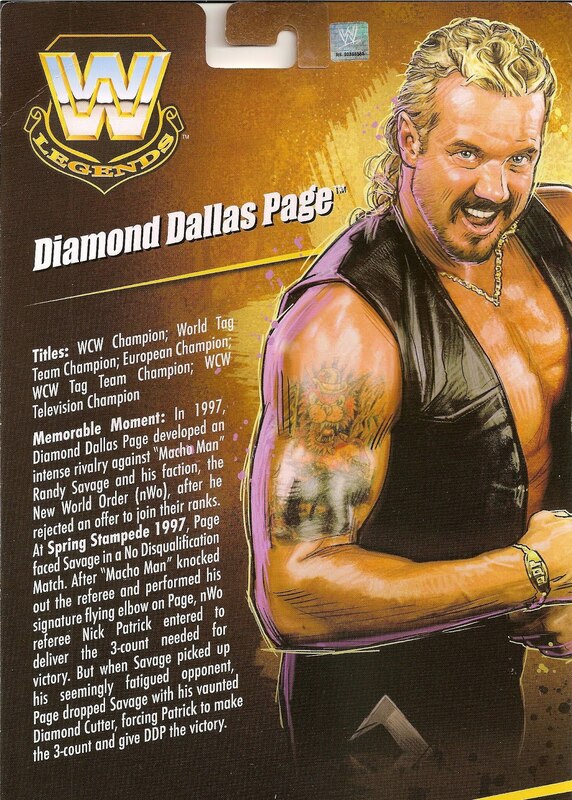 Finally, while I'm glad to have DDP in the Legends line (hey, we're slowly building up that WCW roster! ), I have to agree with most fans that his face is a sore spot and not doing much to sell the rest of the line. I plan to customize my figure a bit to get him closer to accurate, but lately most of my free time has gone into clearing out a lot of my old toys and it seems like I never have enough time to enjoy the new stuff! You know what would make DDP great? A Kimberly Page action figure! You remember Kimberly, don't you? League of Extraordinary Bloggers: Ninja Attack!